A new stained-glass window marking the life of war poet Ivor Gurney has been called a "fitting tribute" to those who served during World War One. 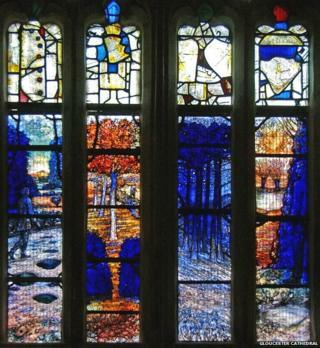 The window, by artist Tom Denny, has been unveiled in Gloucester Cathedral where Gurney was once a chorister. Each light is said to draw inspiration from the poet's love of Gloucestershire but also his troubled life which included service during the Great War. It will be dedicated at a service at the end of April. The Very Reverend Stephen Lake, Dean of Gloucester, said: "It is a fitting tribute to all who served during the Great War and everyone is welcome to come and see this very special piece of craftsmanship." The window was commissioned in June last year with a charity Gurney music festival held in the summer to raise money towards it.